Apple wine, as it is called here, has been a natural part of Estonian culture for as long as anybody remembers. Every garden in Estonia has an apple tree, granny’s and grandpa’s garden has tens. Every second year there’s a natural disaster with gardens drowning in apples. Regardless of the regime in power, home engineered mills and presses have always been at work, shared with neighbors and passed on to the next generation. Large parts of Estonia lay on a layer of limestone and the soil is generally rocky with limestone outcrops, just like in some of the best cider producing regions of South-West England and Normandy. Estonian summer is usually short but autumns can be long, producing perfect less watery fruits full of flavors. We have been making home cider for many years. Over the years these domestic experiments began to result in a product that gradually started to win over our summer lunches, dinners and social gatherings from other drinks. And then people asked us why don’t we make some for sale. This lead to Alvar taking a cider course in Gloucestershire and later practising in Somerset at Burrow Hill. Our “cider-philosophy” is based on a principle that cider is a natural product and the more we can preserve of the natural in the final product the better and more complex it is. We try to nurture the natural fermentation for as long as possible into the process, add only what is absolutely necessary, and give the cider plenty of time to develop. We are focusing on bottle fermented traditional method cider. Jaanihanso has over 25 hectares of perfect soil that we have started to fill with apple trees. First 5300 trees of apples, pears and sour cherries have been planted and many more will follow. With the assistance of some of the leading growers and academics we want to get the best out of traditional local varieties. The main varieties that we use for making cider are: Talvenauding, Paide Taliõun, Sinap Orlovski, Antoonovka, Dolgo, Karksi Renett, Liivi Kuldrenett and Tartu Roos. 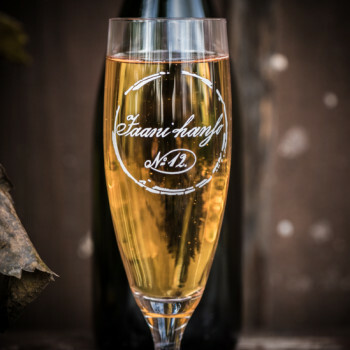 Since fall 2016, Jaanihanso is a certified organic cider producer.